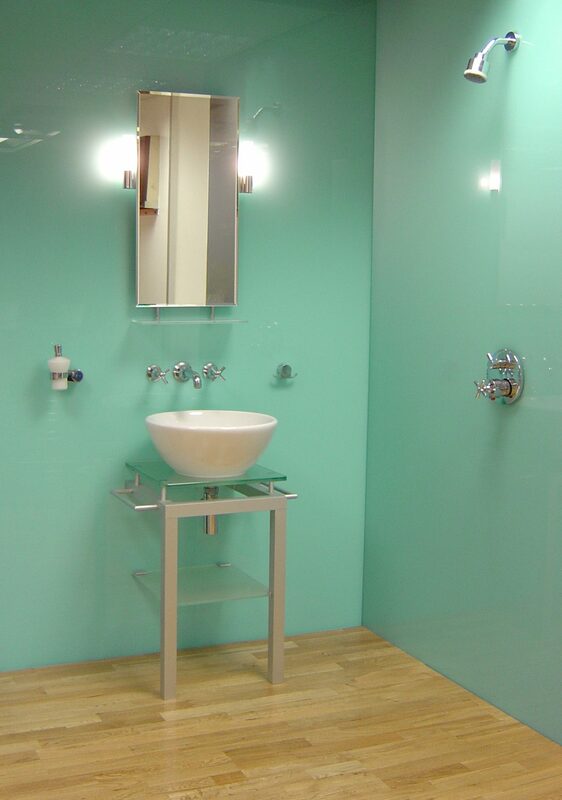 Turquoise has many shades and all of them seem playful, even when they are displayed in a very bright and polished space. 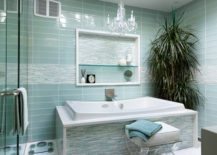 They bring some warmth into the room, despite its natural cool hues, and take the seriousness away from the plain cold tiles! Turquoise and white are both very cheerful colors, together creating a very that benefits from the natural light as it illuminates every corner of the beautiful bathroom! 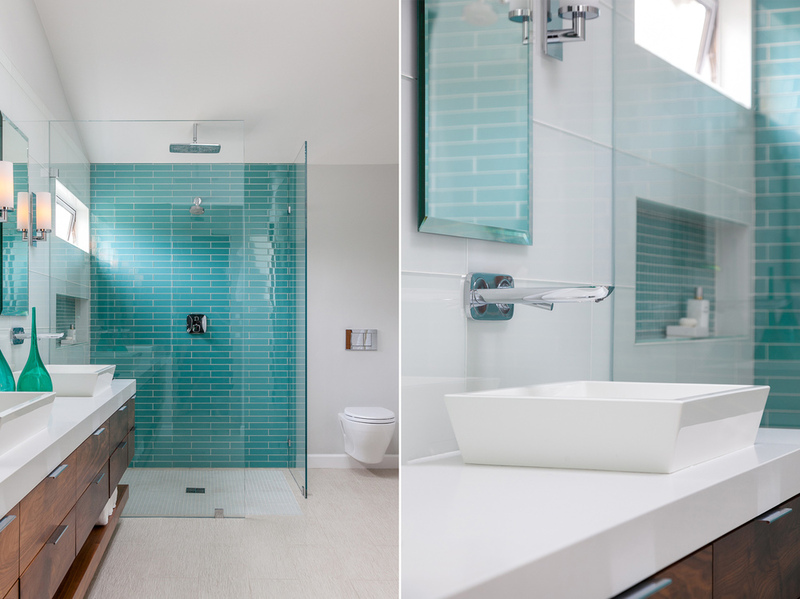 can impact the entire space if the shower has glass walls that allow the color to reach the rest of the room. 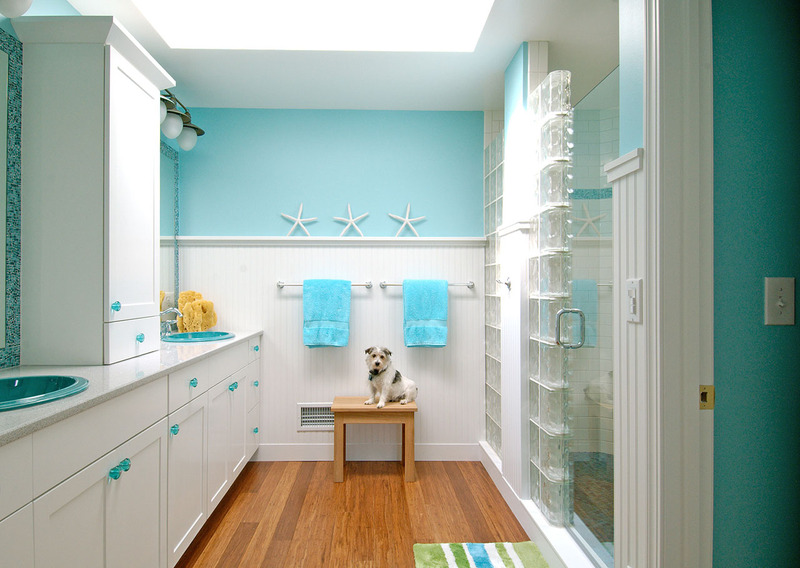 It creates a special corner within a bright bathroom but still affects the overall interior. 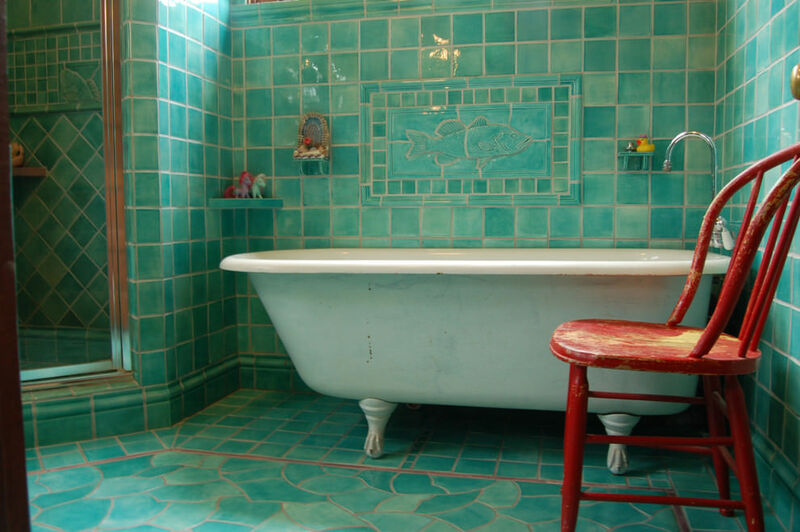 Here’s a great example of how magical turquoise interior can be in a bathroom with . 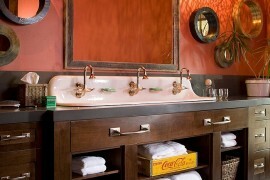 It emphasizes the old-fashioned undertone and gives the room a sense of familiarity. 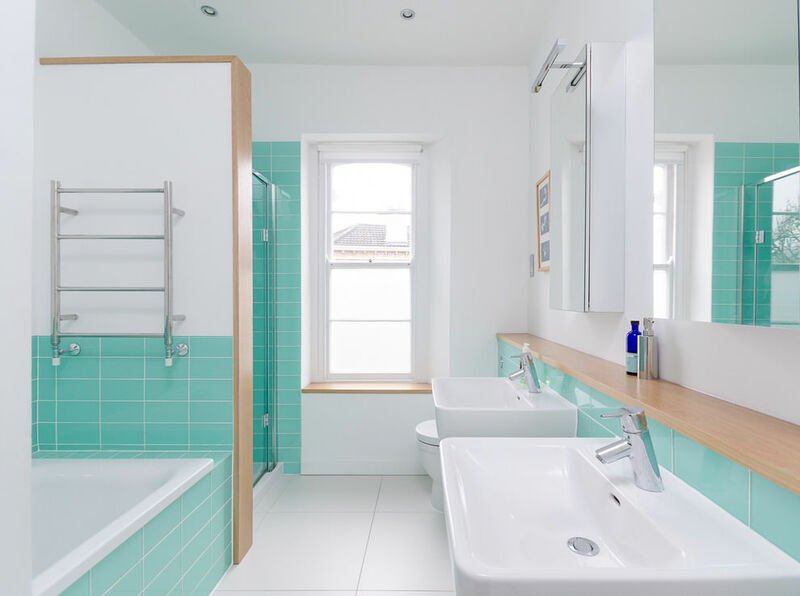 give this modern bathroom a stylish and upscale look that, when paired with white tiles, opens up the space and makes it feel much wider than it actually is! 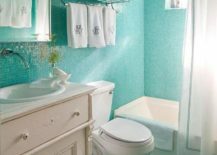 If you are not afraid of committing to one dominating color, a bathroom with a distinct turquoise backdrop is for you! 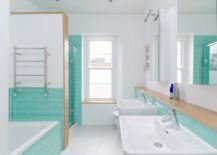 This bathroom is submerged into and only paired with a select few white elements. is easily called a magical place. 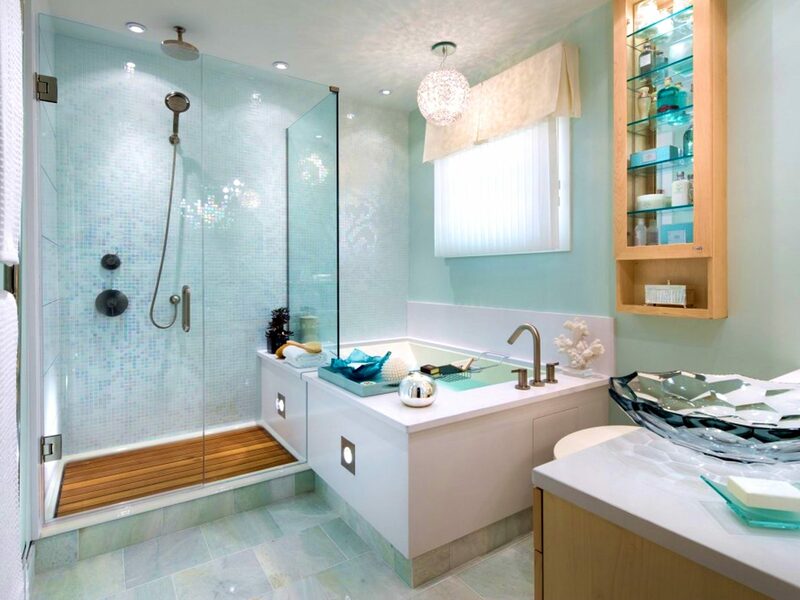 It has a certain charm that cannot be found in other colors, due to its canny resemblance to clear ocean water that fits so well with the bathroom theme. 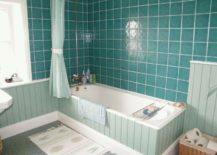 If you decide to go with and dress up your bathroom in the striking color of mint, your bathroom may end up looking a little retro. 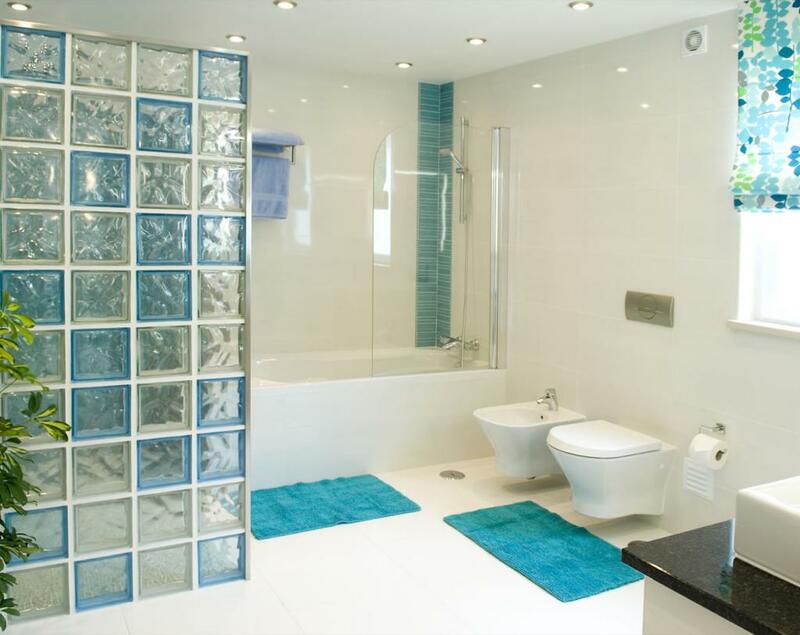 It’s a great choice for a smaller but open bathroom that needs to feel intimate and welcoming. It’s amazing how were always meant to be! This pairing is the birth of glamour and luxury. 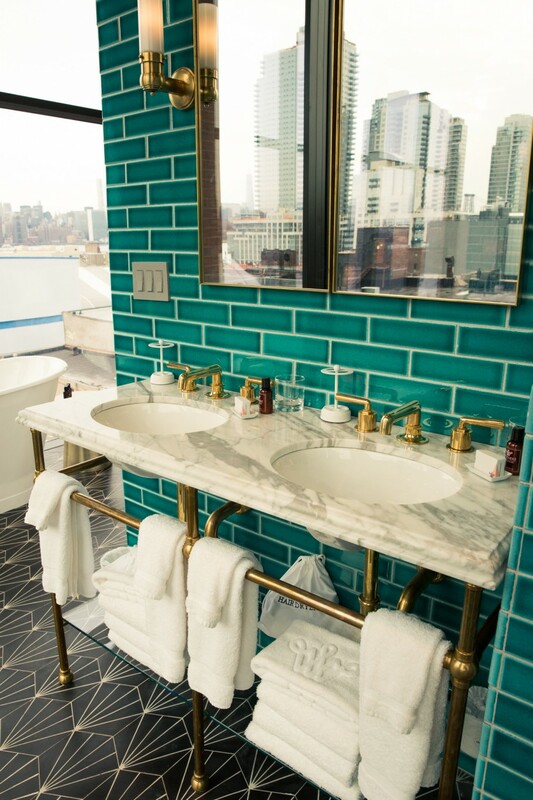 Turquoise is a fantastic whimsical backdrop and gold is the queen of metallic decor – each one enhancing the other one’s gleam! 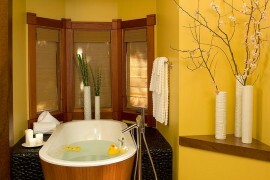 brings together a variety of elements that together create a timeless sanctuary. 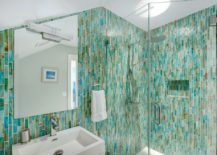 The turquoise tiles set the colorful tone for the whole bathroom while the marbled counter and the stone sink give the space a contemporary touch. 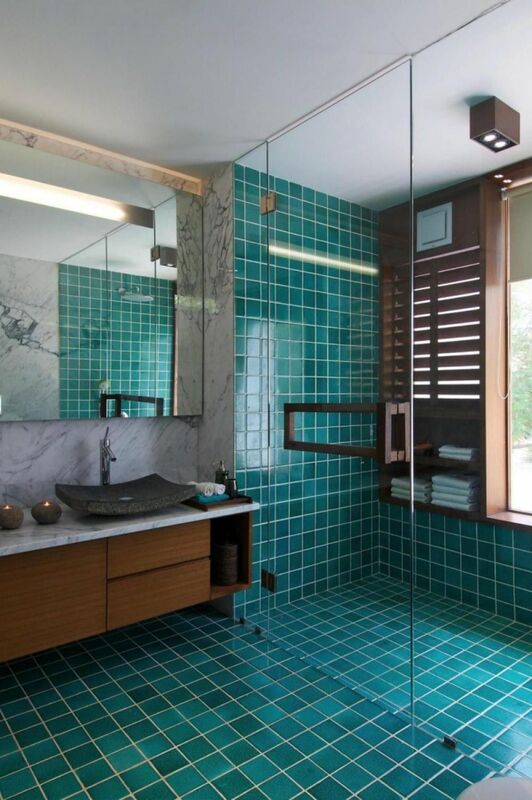 A turquoise bathroom feels energetic and alive. 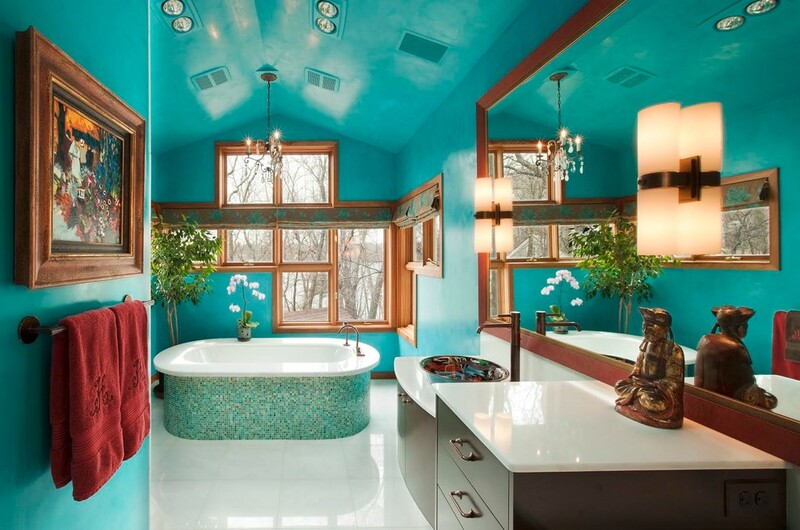 Maybe that’s because of the vivid and intense color, or because of the bathroom’s strong character. It’s a safe haven, one that uplifts you the second you step into it and fills you with joy and positivity! 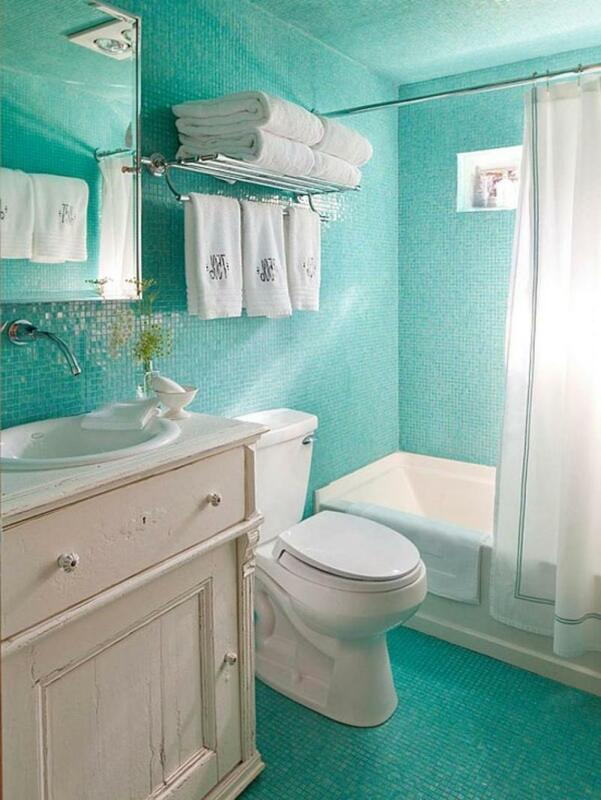 Because turquoise is such a strong color, just one painted wall will be enough to define the whole bathroom. It definitely takes over the room with a modern force and wonderfully contrasts the hardwood floors. 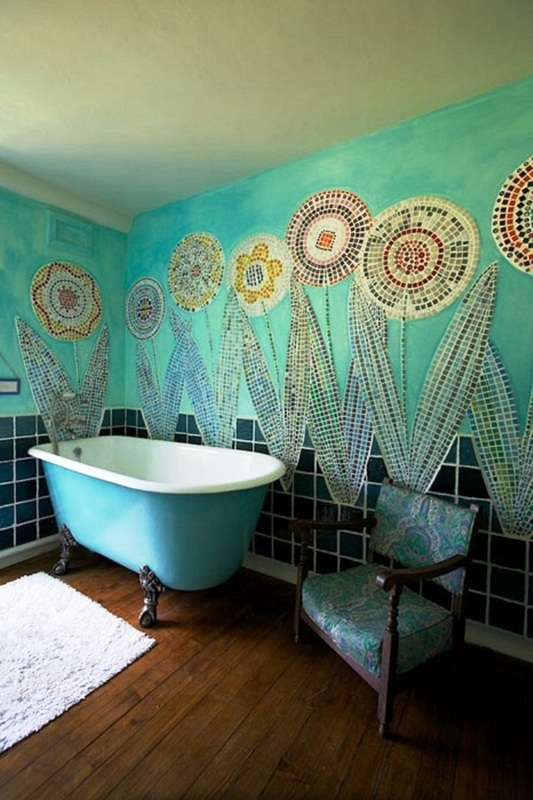 A small bathroom can really show its full potential when the interior is vibrant and cheerful! 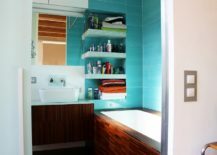 Turquoise is a very versatile choice that doesn’t only brighten up the space but also pairs well with the wooden decor elements. 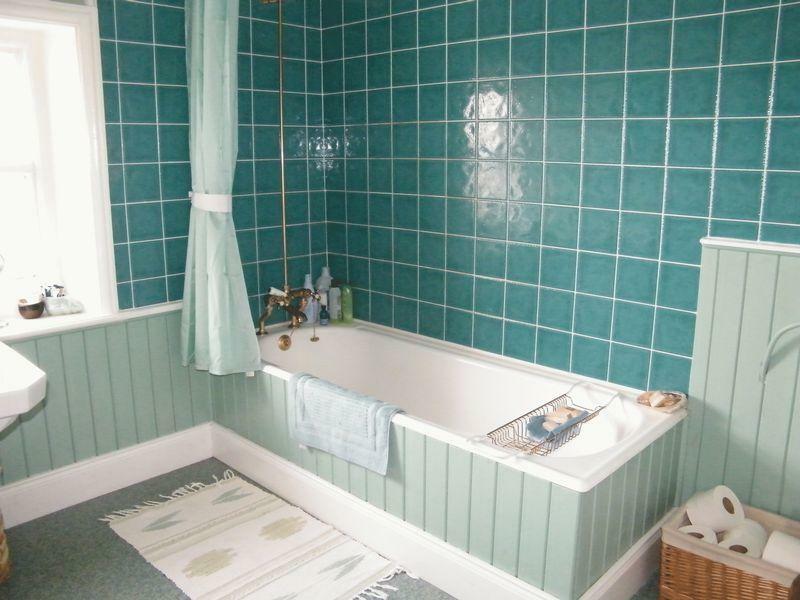 A narrow bathroom decorated in full turquoise is an intriguing and compelling setting. 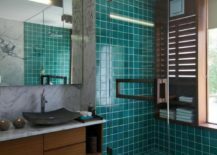 gives the room a coherent ambiance that totally outweighs the narrowness of the space, but nonetheless the bathroom remains a bit mysterious! 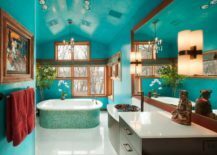 The most recognizable feature of turquoise hues is how they are able to pair with any color imaginable. They are so adaptable that any color can be their perfect match. 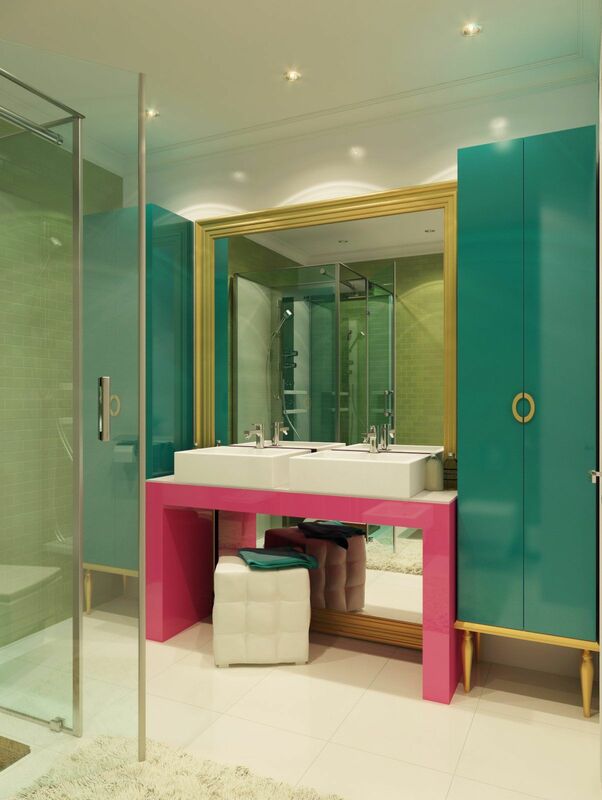 This bathroom combines with a glamorous gold and a vibrant pink! 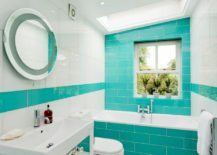 Implementing turquoise into a bathroom doesn’t necessarily need to be done with tiles or painted walls – it can also be done with that are just enough to spice up the bathroom and create variety! 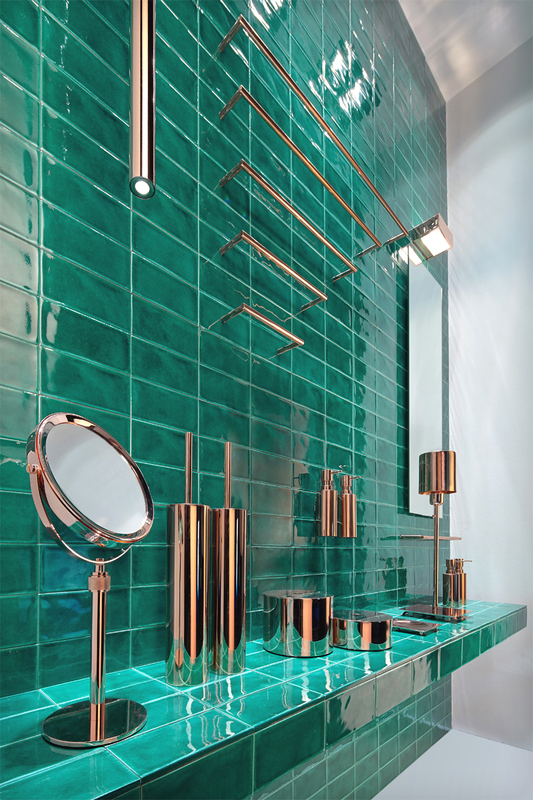 There’s no denying that turquoise is one of the most diverse colors to choose from. 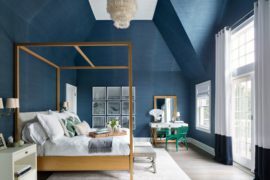 Taking its wide palette of possible shades into consideration, we can conclude that it can surely be of a vivid and bold shade, but it can also be light and gentle. 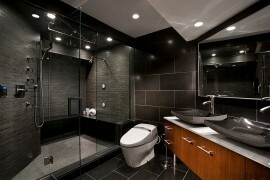 For in the bathroom, is a splendid choice. 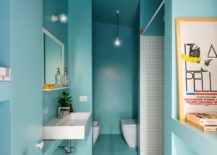 It creates the perfect harmony between a bright interior with a lively spirit and calming color tones that don’t feel overwhelming. 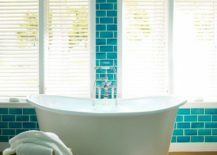 There’s something so special about a turquoise bathroom that we can easily compare it to a spa. 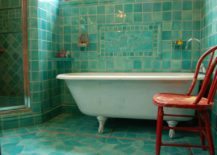 Bathing in such a captivating space will feel like a ritual, thanks to the cold color palette creating an extraordinary ambiance! 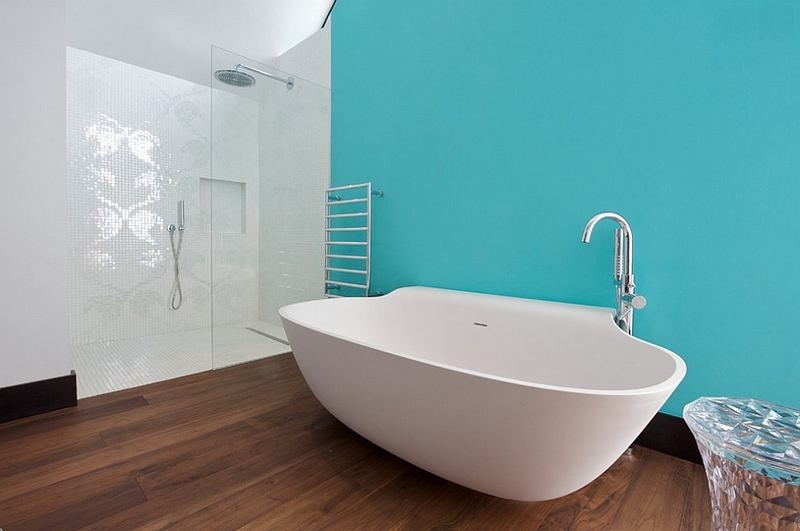 creates much diversity in the space, balancing the bold dark tiles with the light mint bathtub. 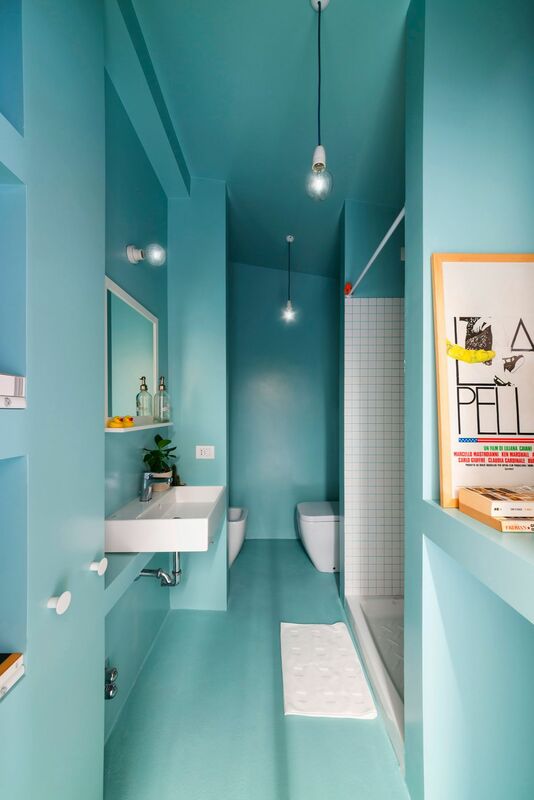 The interior feels harmonious and consistent, perfectly capturing both sides of the turquoise color; the side that is bold and the one that is peaceful! 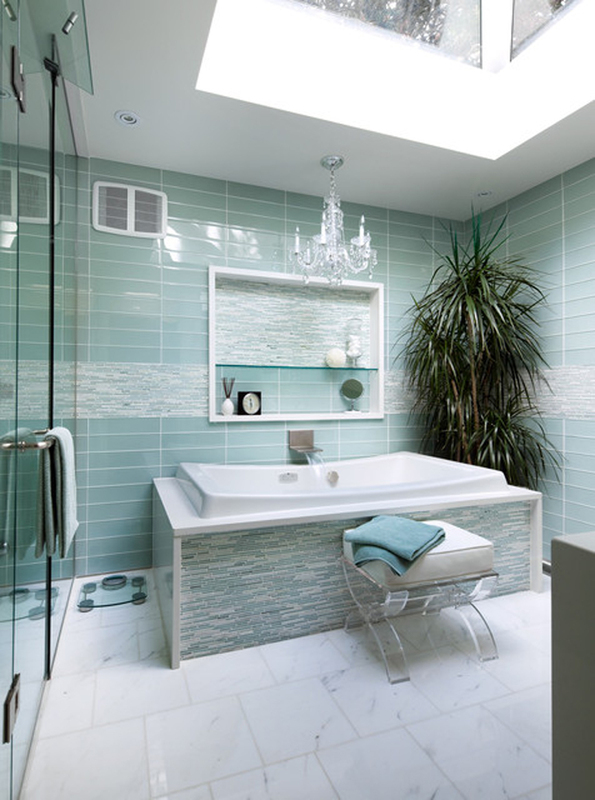 is very bright, the gentleness of the blue-green combination allowing much daylight into the space. 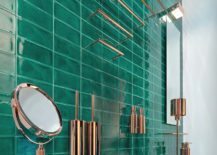 It’s impossible to deny the bathroom’s sophisticated look which is likely created by glass elements that emphasise the colorfulness of the space. 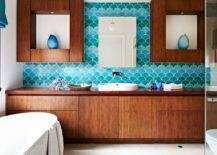 definitely makes us think of a home spa, its vibrant turquoise interior defining the space like no other element could, though the wooden decor pieces give the room much warmth. 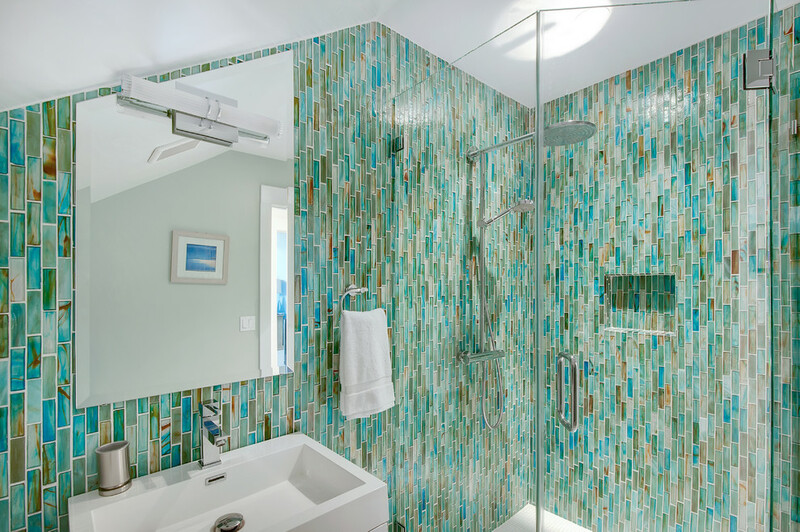 A unique choice of tiles that holds many shades of blue and green resembles the colors of the rainforest, turning your bathroom into a true that draws inspiration straight from the nature itself! 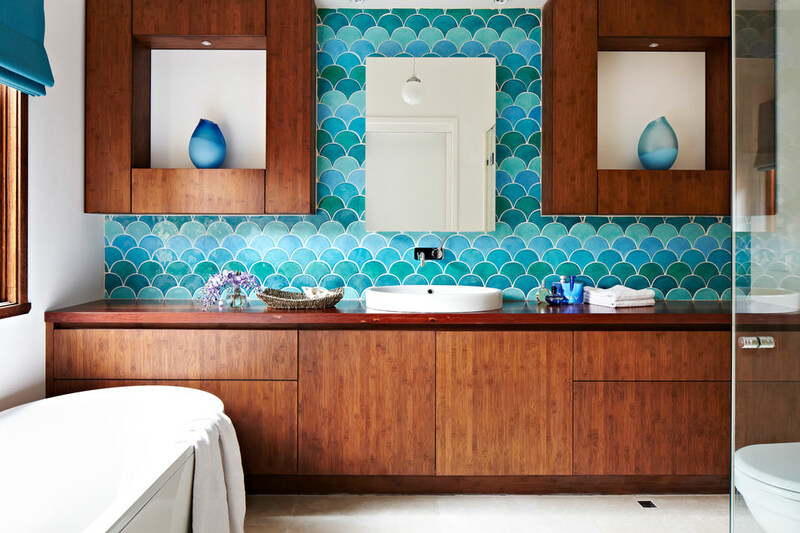 An innovative wall decor has a lot of power over the room, proving its charm in this turquoise bathroom that feels like it belongs to another time. is very visible and we love how that doesn’t make it feel any less classy or prestigious. 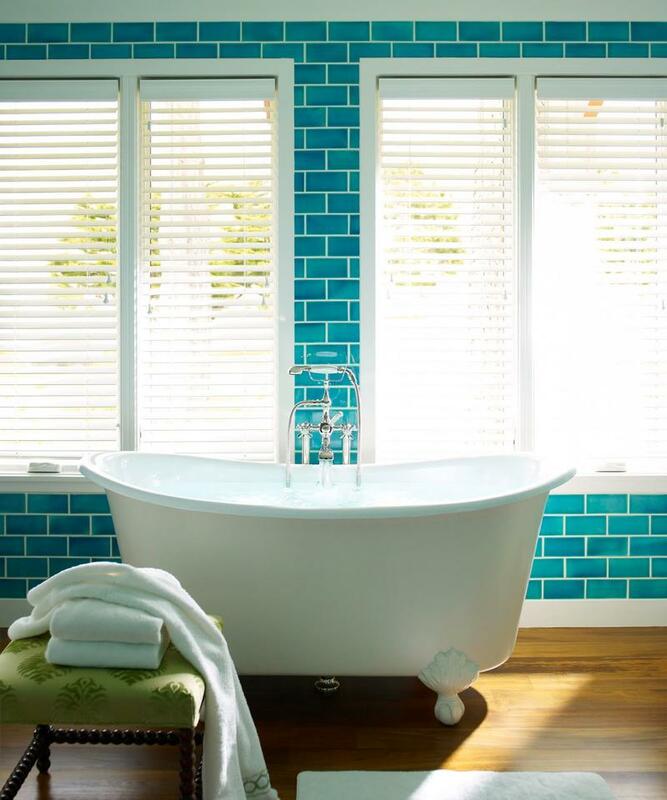 seeks inspiration in coastal decor, highlighting the color’s resemblance to the sea. 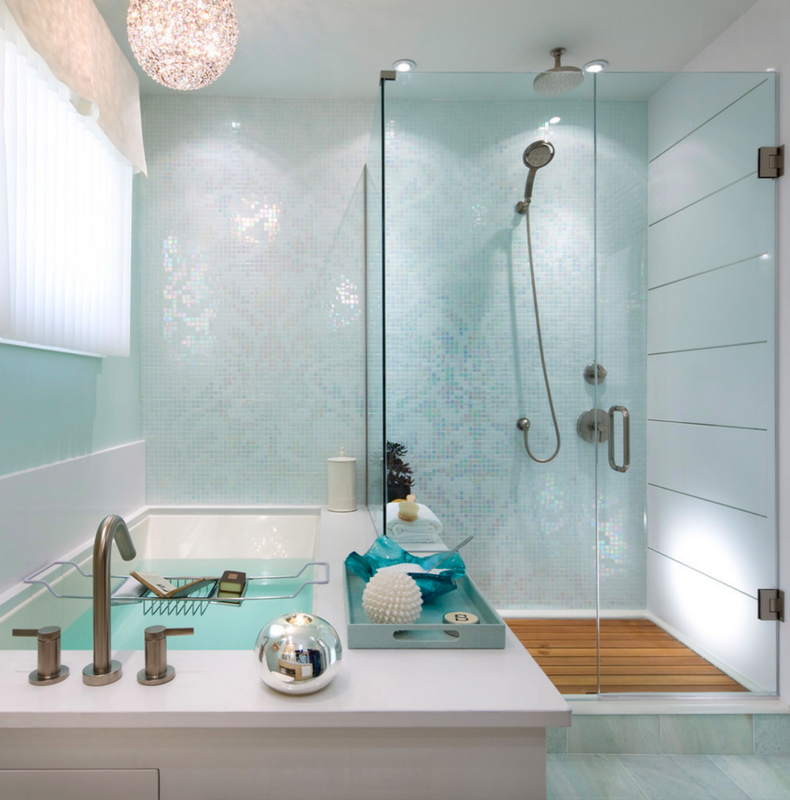 When paired with white elements and bright lights the room almost gives an illusion of being at the beach. 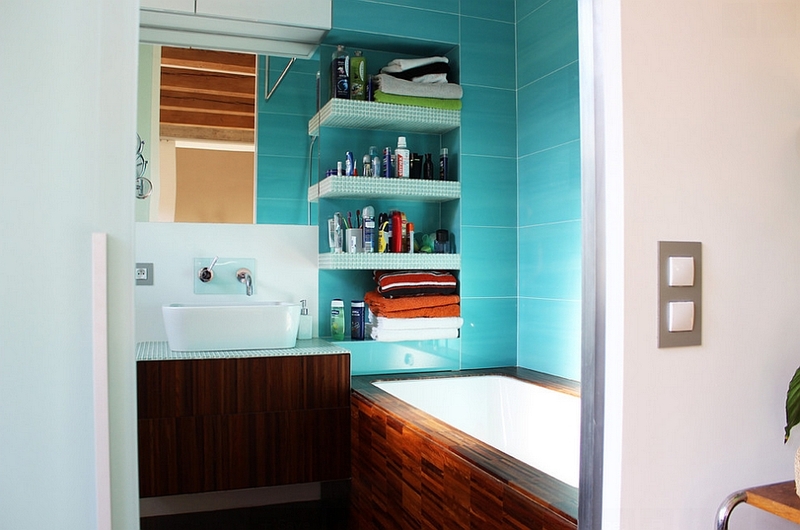 An open bathroom with a lot of daylight benefits from . 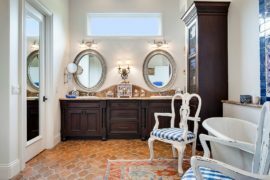 It creates a feeling of familiarity and security, the soft colors not dominating the room but rather making way for the abundance of natural lighting. 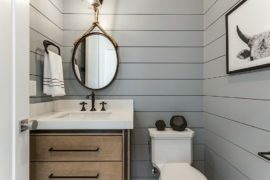 Wood and turquoise match very well. Even though they appear contrasting, it’s precisely their differences that make them such a good match. that resemble fish scales are on the colder spectrum of colors, while the well-known sight of wood feels wonderfully warm. 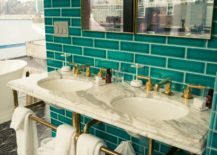 is amplified by the marbled sink and golden pipes, straying away from the mainstream glamorous bathrooms that usually don’t have much color and showing how a bold shade of turquoise can uplift even the most high-class interior!